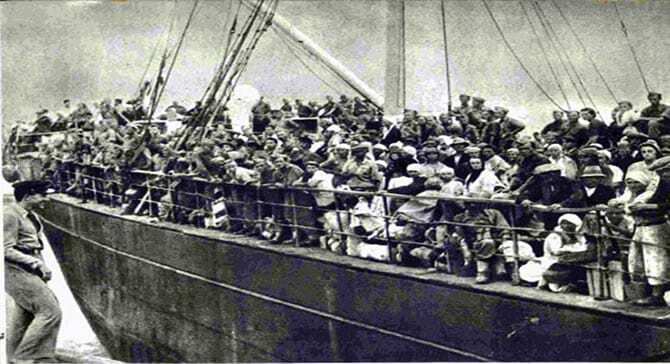 The Polish Evacuees from the Soviet Union who had left Krasnovodsk (Modern day Turkmenbashi) by boat and crossed the Caspian sea over a 2 - 5 day period were to experience their first moments of freedom in Pahlevi, Persia (Now called Banzar-e Anzali) starting on 25th March 1942 when the first boat landed there. The Persian residents of Pahlevi were given no advance warning of the vast numbers of Polish evacuees that were about to land on their doorstep. In fact in "The Ross Report" mentioned below, originally 2,500 evacuees per week were planned. The reality was going to very different to this as you will see. One thing that becomes apparent through all of the experiences in Pahlevi is the great friendliness show by the Persian people towards the Polish. We are heavily in debt to Lieutenant Colonel A Ross whose role was to assist and report on the initial preparations in Pahlevi for receiving the Polish Evacuees. Much of the information on this page is gleaned from his report AKA "The Ross Report" Pahlevi 1942. It was on the 24th March 1942 (one day before the first ship arrived, which had already set sail from Krasnovodsk) that Soviet authorities gave consent for the British along with the Polish to establish an "evacuation base" in Pahlevi. It had been previously agreed that around 2,500 evacuees per week would be dealt with through this base. A sudden change happened in the plans from Soviet High Command and this was revised at 6,000 per day i.e around 45,000 per week! The evacuation staff arrived in Pahlevi on the 25th March 1942 expecting to have 2 days time to prepare for the first boat that was scheduled to arrive on 27th March 1942. They quickly learned the first boat had already arrived and was waiting outside the harbour with off-boarding anticipated for that evening. This first boat contained 1,387 personnel (who were mostly sailors and airmen) so the evacuation staff hurriedly went about getting ready to receive them. And thus ensued a hurried craziness that would not cease until the last Pole stepped off the last boat. Working out where to house the Poles was becoming an epic problem. Originally, accommodation for 3,000 had been hired but clearly this was not going to be the solution that was required. The only answer seemed to be to put the evacuees out in the open, perhaps on Pahlevi Boulevard and on the West side of the beach with an overflow camp being setup at Rescht. Owing to strict dis-infection rules for all arriving Polish evacuees and the fact that many of them carried typhus, it was decided that the plan to have an overflow camp at Rescht could not take place as there was already typhus and small-pox infections there that were being contained. Therefore, the plan to have the arriving Polish evacuees have initial accommodation on the beaches came to be the only viable solution to dealing with such vast numbers arriving daily. When the first boatload of Poles arrived they were housed in the reconnaissance buildings, but boatloads after this would face sleeping on the beach under the stars. The climate at the time was cold, with a light snow fall being recorded around the 25th March 1942, but by 27th March 1942 this had dis-appeared, and just as well for the arriving Poles although there were a number of rainy days at the time as well particularly on the 8/9 April 1942 when it rained continuously for 48 hours. It was on the 27th March 1942 that General Okulicki, Chief Of Staff to general Anders, arrived from Krasnovodsk along with 902 evacuees. General Okulicki held a conference and at this he proposed the forming of 2 camps for the evacuees. One would be on the West side (Pahlevi side) of the port entrance and one on the beach side (Kazian side). General Okulicki proposed that evacuees on arrival would go into No1 Camp (West side), this camp being known as the "dirty camp" and from their they would proceed to the disinfection centres. After disinfection they would then proceed to the "clean camp" (No3 camp). Also near camp No3 was a bus point that would carry women and children to the disinfection centres. As early as 23rd March 1942 officials were attempting to purchase food, tools and shelter locally (remembering that they had anticipated around 2,500 arrivees per week), this activity had to be rapidly scaled up as on 4th April 1942 a peak of 30,000 Polish evacuees from the Soviet Union were present in Pahlevi. Indian drivers were hired and worked 24 hour days along the treacherous roads to Pahlevi bringing needed supplies. Some of the early units to arrive from the Soviet union also assisted in bringing supplies into Pahlevi to ensure the evacuees could be suitably looked after. On the 26th March 1942 (The day after the first boatload of evacuees had arrived) The British Base Evacuation Staff took up residence in the Grand Hotel on the Kazian side of the harbour. Meantime, the Polish Base Evacuation Staff setup on the Pahlevi side of the harbour with this becoming known as "No2 Camp". 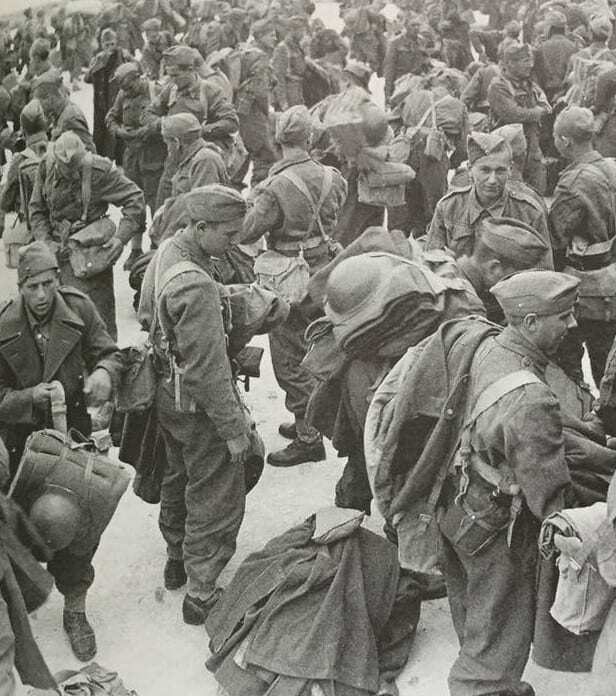 Both the British Base Evacuation Staff and the Polish Base Evacuation Staff would now work together to manage all arriving Polish evacuees arriving from the Soviet Union. Four dis-infection units were put in place. One was put on Pahlevi Boulevard, one was "33 mobile bath units" , one was in the local public swimming baths in Pahlevi and that last was within the caviar & fish factory in Kazian (to this day Iran continues to be a main exporter of caviar). Initially it was a struggle to dis-infect all arriving Poles, their luggage and their clothes, owing to the lack of staff, but in time they perfected this process and ran it 24 hours a day and were able to disinfect over 4,000 per day. The Soviets controlled a small hospital on the Kazian side and had promised this to the Polish Evacuation Base Staff, but this promise kept getting put off. Meantime the Poles had infectious diseases that needed isolated and treated so to speed things up they placed 4 corpses outside the hospital door at which point the Soviets got the point and handed over use of the small hospital to the Poles. You have to admire the resourcefulness of those trying to manage this epic arrival of sick and ill polish evacuees from the USSR. Bread was made locally using government supplied flour and very many bakers were involved in the continual supply of bread. As it was unknown how many evacuees would arrive on any given day or even the time of arrival, managing supplies and rations became a very difficult task. Rather than issuing canned meat it was decided that the the camps should have cooks on site. Originally contracted cooks were brought in but by the 7th April 1942 the Poles themselves were managing the cooking in the camps on the beach by themselves with support from the British Army Bakery and Butchery departments. Due to the massive demands being made on the local food markets, the price of local food rose dramatically and in some cases the price of meat doubled. Yet, through all of this, many people were part of the solution that made sure the Poles were made welcome, fed and looked after. 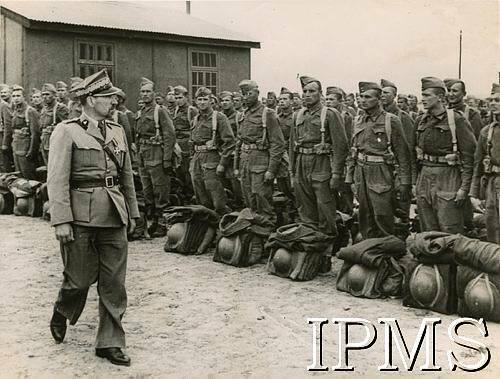 Although uniforms and equipment were sent to Pahlevi to equip the Polish troops, the vast majority of them already had the new British uniforms (supplied to them in the Soviet Union). Contrary to popular belief, not all clothing worn by the Poles and brought from the Soviet Union (that was ridden with lice etc) was burned at Pahlevi. Rather, records indicate that the clothing was disinfected and sent back to the Soviet Union for the use of their fellow Poles. The compassion and thought for the fellow countrymen in this was outstanding. The area assigned for the camps covered in total about 2 square miles, so we quickly get an indication of how busy and crowded it was for so many Poles to live in the temporary accommodation of the Iranian tents. 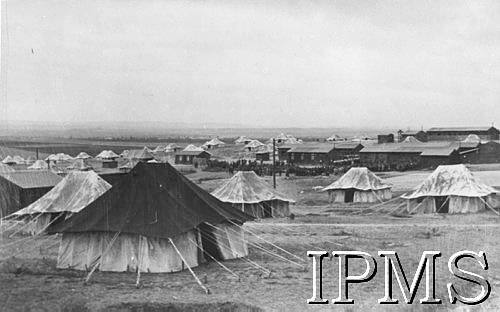 The camps themselves commenced being built around the 27th March 1942. On 18th April 1942 dismantling of the camps started. As there were some really rough seas on occasion, the larger of the transport boats whom were unable to normally dock at the harbour, had to anchor offshore with rations being transported from onshore via the steamers to the transport boats. This ensured that the Poles who were waiting on the transport boats would have sustenance. In the worst instance, a boat had to wait a full 36 hours before being able to offload its passengers. Boats from Krasnovodsk would arrive daily with no predictability and at any hour. The larger boats would anchor outside the harbour and local steamers would be used to offload them to shore. On arrival, many Poles would fall down onto the sand, kiss it even and celebrate their arrival to freedom, free of the soviet union. However, many died on the beach on arrival, too weak to carry on, having held on long enough to experience safe arrival. So sad. The civilian evacuees that arrived were often completely destitute. The awaiting evacuation team would do all they could to help these people, arranging transport to the "dirty camp" and transport to the disinfection centres. They were fed as well, although initially it proved problematic to ensure they had food each day. The reception areas struggled to cope with the sheer volume of poles arriving who were thirsty, hungry, sick, suffering from malnutrition and confused. We stepped out onto the jetty and down onto the hot, fine sand. We had left Russia and its horrors behind. We were free. Yet even the moments intense rush of joy and elation was tempered by remembrance of our loved ones who had died in that terrible country. The scenes on the beach were both joyful and distressing. Some were sitting eating picnics, some paddling and yet others wondering around aimlessly whilst yet others, too sick to move, lay there dying. The worst point for civilians was the night of the 3rd/4th April when of the 30,000 Poles present in Pahlevi, around 7,000 of them were civilians. Coincidentally, the 3rd April 1942 was when my own grandfather arrived in Pahlevi, he would have see the absolute worst of it. When the first ships came in on April 1942 the Persians were shocked and bewildered at not only the number of arrivees but also their poorly condition. The Polish soldiers as well as the civilians were naturally anxious to acquire items that they were deprived of in the Soviet Union. Unfortunately, the Poles who chose to visit local shops and markets had not always been through the disinfection process and in some cases clothes that the Poles wore were exchanged for other goods. These clothes carried lice as well as infectious diseases. The Persians exposure to infectious disease was amplified by the fact that some of them chose to enter Camp No2, the "dirty camp" that contained non-disinfected Poles. The Persians traded with the Poles and even with the camp guards who did little to stop the Persians entering the camp. To address this, the Polish soldiers pay was temporarily stopped so that they have no monies to use for trading with the Persians. In the end, Camp No1, the "Dirty camp", which was on the West side of the harbour, was abandoned on 5th April 1942 when the last of the existing evacuees there was disinfected. Any evacuee arriving on or after the 2nd April 1942 would be placed in Camp No4, the new "dirty camp". The last boat carrying 1,982 evacuees arrived on the 5th April 1942 in the early hours. This brought the total number of Wave 1 evacuations to 43,808. 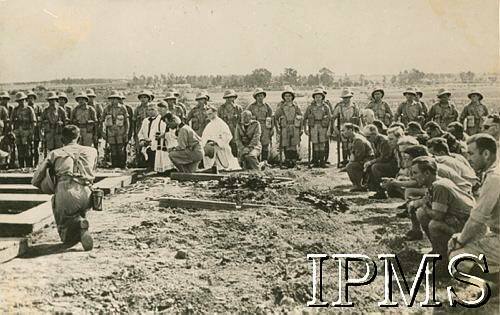 The vast majority of Poles were Roman Catholic and thus were present at Mass on 5th April 1942, Easter Sunday, on the beach at Pahlevi. By the 5th of April 1942 the Poles had organised entertainment for themselves by way of a Brass band on the beach, concerts and recitals were given and even visiting Generals etc came to see this. On 11th April 1942 the 1st Polish Uhlan Regiment gave a bonfire concert in Camp No4 with Major General Beresford attended this. The ability to have this fellowship on the beach at Pahlevi vastly improved discipline and moral. Only 1,412 were admitted to hospital, which, given the sheer number of arriving poles with sickness and illness is surprisingly low. 38 died in the hospital and 16 en route from ship to hospital. These last 16 we have to feel sincere sadness for. To escape the Soviet Union and arrive at freedom in Pahlevi only to loose it by dying is a tragedy. On 31st March 1942 the convoys to take the evacuees from Pahlevi southwards towards Teheran commenced. All manner of buses, lorries (some with bench seats in the cargo area) and cattle lorries were used to transport the poles further into the Middle East with around 100 vehicles a day departing carrying circa 2,000 personnel. The roads were windy and treacherous, the vehicles varying in state of repair and roadworthiness with the drivers would racing along these roads. Some people died in accidents, which were inevitable given all the factors. In time, Polish guards were put on each vehicle to ensure safer transport for the Poles. The last of the convoys to leave the Pahlevi camp and take the troops South occurred on 25th April 1942. 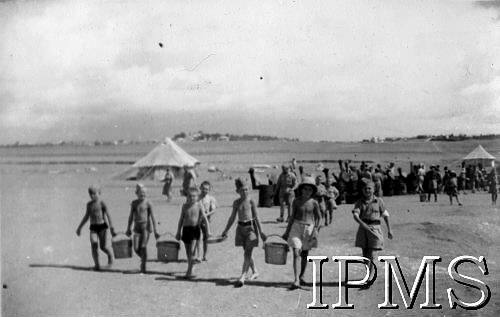 On the beach and the waterfront at Pahlevi reception centres had been setup to receive the Polish Evacuees from the USSR. Initially, they would be stripped of their clothes and some belongings (to ensure destruction of lice and bacteria), these being burnt in a designated area. Them, their hair was shaved off and they were showered via a chemical shower to ensure they were carrying no disease. They were then fed, assigned to a further camp whereon they would be assigned to a tent as temporary accommodation. Others died because they gorged on food, the first real meal they had eaten in years, their body unable to cope. Still others bartered with the local and obtained fruit, dates and suchlike only to be violently ill as their digestive systems tried to cope with the sudden onrush of food not seen for years. Shortly after the arrival, disinfection etc of the Polish Soldiers evacuated from the Middle East, there was a switch in uniforms. Although when they were back in the Soviet Unions 100,000 British uniforms were supplied to them, it's unclear how many swapped their Polish uniforms for the British ones. You would assume all would be willing to do this because the Polish ones were presumably very damaged from their time in the Gulags and their travels south to enlist in Anders army. The fact that British uniforms were also issued in the Soviet union means caution must be used in trying to date/place any Polish soldier in 1942. Either way, once in Pahlevi many switched their uniforms to British ones to reflect the fact that they were now under British command. Although they may have travelled from Krasnovodsk to Pahlevi under their Polish/Russian army unit names (as per Anders army etc), some of these units were liquidated in the Middle East, merged with other units or formed into completely new units. There were a good number of children who made it to Pahlevi as Polish evacuees from the Soviet Union. Some were in "family camps", others who had lost their parents went to Ishafan, known as "The City of Children" and they thus became widely known as "The children of Ishafan"
Photo: Polish children carrying water to the camps in the Middle East.